The New York Council for the Humanities, in collaboration with Interference Archive, will host a James Baldwin reading and discussion group, running weekly from January 23 through March 5 (with a break on the weekend of February 13). 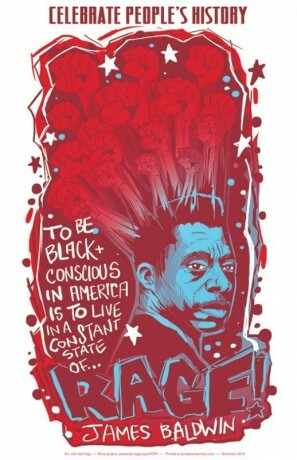 Participants will come together over the course of six Saturday afternoon sessions to discuss a variety of texts by James Baldwin as a lens for talking about current issues in our communities, including race, class, gentrification, and sexual orientation. The program is free and open to the public. Reading is expected in advance of each class. Please RSVP so that we know how many people to expect, and so that we can provide you with access to the readings. RSVP to Jen at classes@interferencearchive.org NOTE: Registration has now been capped due to the higher number of RSVPs; we’ve created a waiting list, and please feel free to contact us if you’d like to be added to the list. Talking about what we read with others in our community is an amazing experience; the New York Council for the Humanities’ Adult Reading & Discussion programs are designed to foster active reading and thinking, incorporating texts that serve as catalysts for civic engagement and cultural understanding, as well as personal reflection. Adult Reading & Discussion programs are currently being held in communities across New York State. For more information about these programs, visit www.nyhumanities.org/discussion-groups/adults. Various options for accessing copies of reading material are available through Interference Archive – contact classes@interferencearchive.org for details. The New York Council for the Humanities is a private, non-profit organization that helps all New Yorkers to lead vibrant intellectual lives by strengthening traditions of cultural literacy, critical inquiry, and civic participation. To find out more about the Council, visit www.nyhumanities.org. Any views, findings, conclusions, or recommendations expressed in this program do not necessarily represent those of either the Council or the National Endowment for the Humanities.